Son of Rabbi Samuel Adler, American physician and professor of clinical medicine in the New York Polyclinic Medical School and Hospital; born at Alzey, Germany, in 1849; emigrated to America in 1857. He was graduated from Columbia College in 1868, studied medicine in the universities of Heidelberg, Vienna, Prague, and Berlin; and received his degree of M.D. from Heidelberg in 1871. 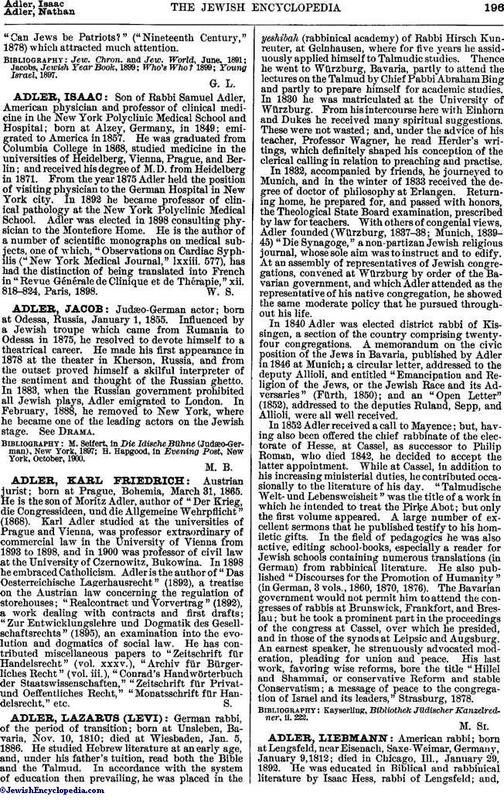 From the year 1875 Adler held the position of visiting physician to the German Hospital in New York city. In 1892 he became professor of clinical pathology at the New York Polyclinic Medical School. Adler was elected in 1898 consulting physician to the Montefiore Home. He is the author of a number of scientific monographs on medical subjects, one of which, "Observations on Cardiac Syphilis ("New York Medical Journal," lxxiii. 577), has had the distinction of being translated into French in "Revue Générale de Clinique et de Thérapie," xii. 818-824, Paris, 1898.